EAST ELMHURST, Queens (WABC) -- The tip of a wing on a airplane was damaged Thursday after it struck a fuel truck backing out of the gate at LaGuarida Airport. United Airlines Flight 1561 had just started to push back when it bumped the truck, which had likely just completed fueling the aircraft. United Airlines said the damage was very minor, and that all passengers were moved to a different plane before heading to Denver. The incident was described as minor, but it was the second time this week there was a collision at LGA. Two American Airlines planes clipped each other Tuesday, causing moderate damage and delays for passengers. 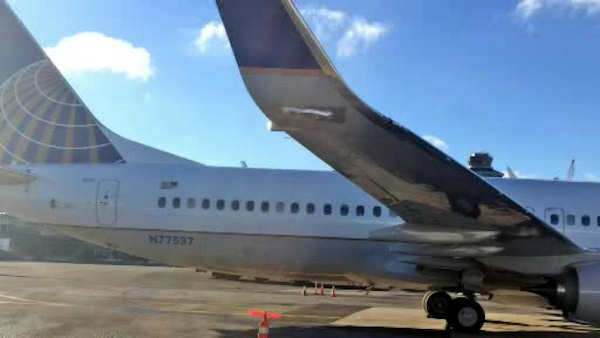 The Port Authority said an American Airlines plane struck an American Eagle aircraft, operated by Republic Airlines, while pushing back from D gates at Terminal B. The other plane was already at the gate and had no passengers.